I love bizarro vintage stuff like this. 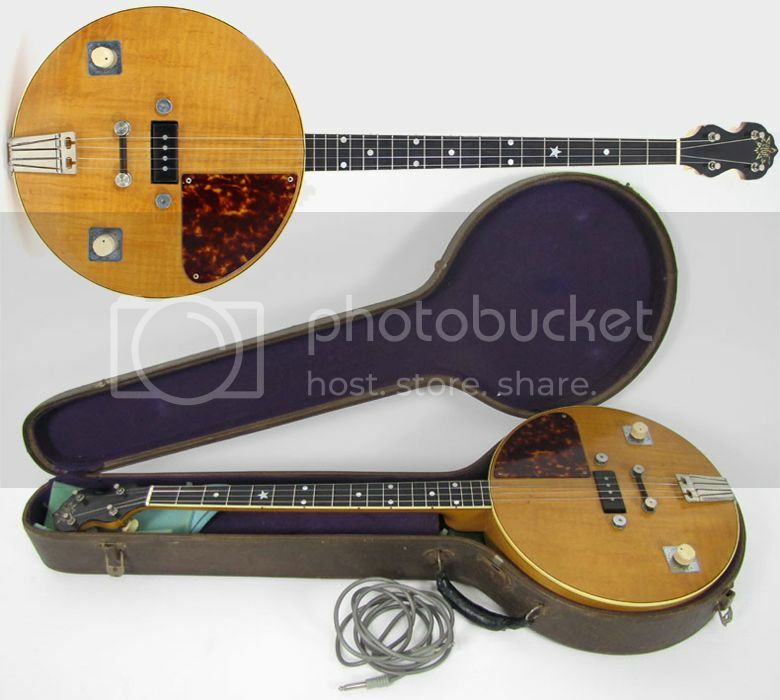 This isn't a round electric guitar, it's an electric tenor banjo bearing the Vega brandname and can be dated to the late 1930s thanks to a pencil inscription on the inside of the removable back. Description: 1930s / 40s Very Rare Vintage Vega Electric 4-String Tenor Banjo made in USA. Condition: Super cool vintage vibe - various minor nicks, chips, dents & dings; surface scratches, finish wear & light weather checking. Overall the banjo has a great look to it with a gorgeous patina. This is an exceptionally rare instrument and is the first of its kind we’ve had in the shop. Body: Double bound 11 7/8” diameter body with maple top, back and sides in natural finish. There’s some really pretty flame figuring in the top & back. Nickel trapeze tailpiece with height-adjustable rosewood bridge; single-ply tortoise pickguard. There are no cracks in the pickguard. 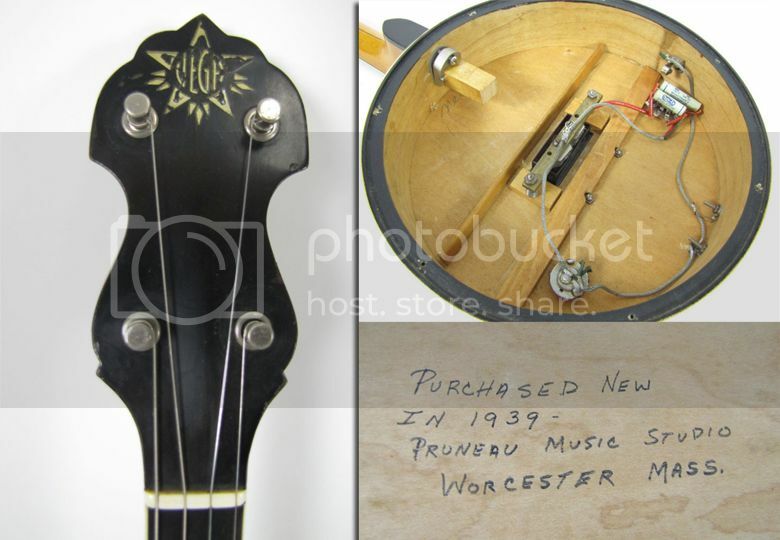 A hand written note on the inside of the back panel reads: “Purchased new in 1939 Pruneau Music Studio Worcester Mass”. Neck: Soft “V” shaped maple neck with ivoroid binding & red side-dots. Ebony fingerboard with pearloid star & dot inlays. Nickel machine tuners with ivoroid buttons in perfect working condition. 1/8” nut width, 23” scale length. There is a 9-digit number pressed into the back of the headstock, which appears to be a social security number. Pickups/Electronics: Original single coil pickup with master volume and 3-way rotary tone control with settings for bass, normal and treble. Playability/Sound: This banjo produces some exceptionally good tones both acoustically as well as plugged in. The pickup provides excellent output (2.03 Ohms) and a sound that is full, rich and has the utmost in ringing clarity. The three-way tone control allows the player to dial in highly useful sounds. The hollow maple body creates an overall “openness” to the sound that still retains plenty of snap and attack. The neck is exceptionally comfortable and is set up with perfect action. Case: Includes equally rare hardshell case with multiple stripes in the tolex & two vintage screen prints of dancing women. Currently listed on eBay by Cream City Music in Brookfield, Wisconsin, with bidding currently nearly at $600 and just under a day left on the auction at the time of writing. Me too. Surely someone must have recorded with one of these at some point. It's a tenor guitar. IMO it's never a banjo if it doesn't have a head!